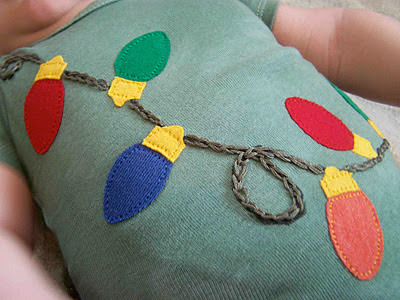 I love appliques, it is such a quick and easy way to dress up any shirt or onesie. I especially like using knit fabrics for appliques, not only are they soft, but they make appliqueing even easier because they don't fray like a quilters cotton. I thought that today I'd share some of my favorite supplies, stitches, and secrets to creating successful knit appliques. Whenever I make an applique, I always use some sort of fusible adhesive. It eliminate the need to pin your fabric to the material, and it stabilizes the knit fabric, which can often be a bit shifty to work with. There are several fusible adhesives available, but my all time favorite is Wonder Under. 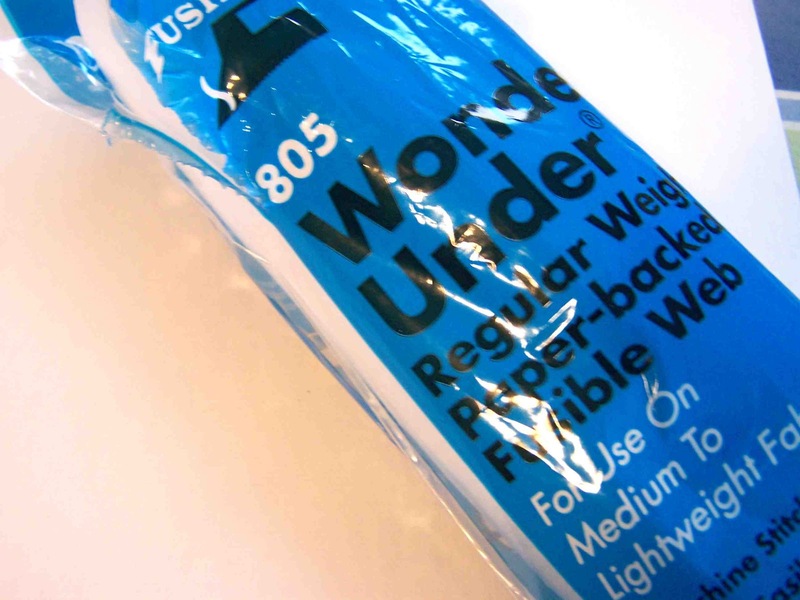 You can find both Wonder Under, and Heat and Bond Fusible adhesives in light/medium weight and Heavy weight. 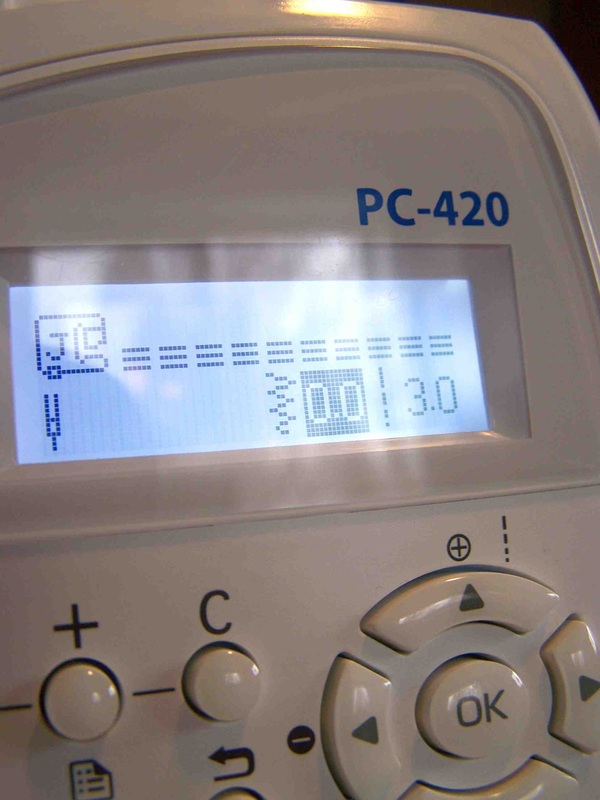 The heavy weight fabric, or ultra hold adhesive is intended to eliminate any need for machine stitching. It is also better suited for heavy fabrics. I don't trust my iron like I do my sewing machine, so I always like to stitch my appliques down. For that reason I use the light weight or sewable bond adhesive. The main reason that I prefer Wonder Under over Heat and Bond, is that it doesn't gum up my sewing machine needles. I don't know if any of you have ever had this problem, often times as I go about appliqueing my project, the sewing machine needle will get a build up of adhesive along the shaft, causing my sewing machine to skip stitches. It drives me CRAZY. Wonder Under is thinner, and more flexible, and I've never had it gum up on me. So, before I ever cut out any shape for my applique, I adhere my fusible adhesive to the wrong side of my fabric piece. Whether you purchase your fusible adhesive in a package, or by the yard, it should come with manufacturers directions. Follow them. 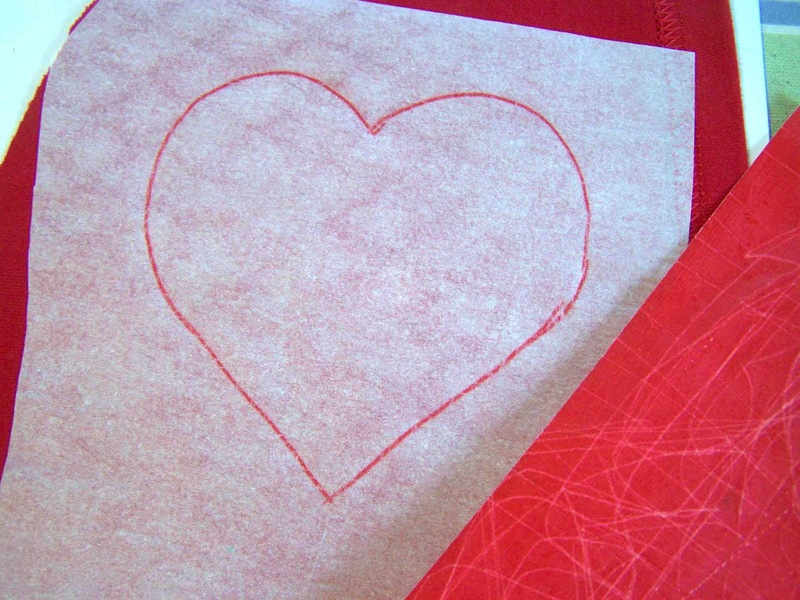 There will be a paper backing on one side of the fusible adhesive. I leave this in place and use it to stabilize my applique as I transfer the image, and cut out my shape. Once my fabric is prepped, I use a dress makers carbon transfer paper to transfer the image to the paper backing of my fusible adhesive. Once transferred, I cut out my image with the paper still in tact. Once it's cut out, off goes the backing paper. 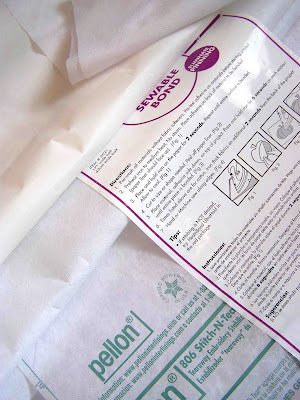 Your prepped applique can now be adhered to your item of clothing. Make sure that the item to be appliqued is clean and free of wrinkles before adhering your applique. NOTE: If your applique consists of multiple layers, I recommend stitching no more than two layers together at a time. It prevents gumming of the needle. 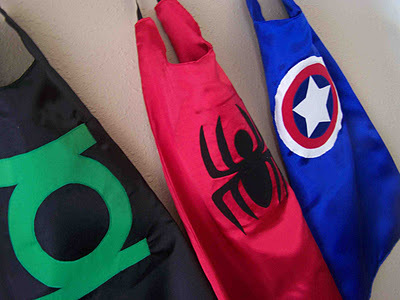 An example is the super hero capes that I make. The Captain America emblem consists of four layers of knit. I always start at the top and work my way down. The star is adhered and stitched to the blue, then the blue to the red, the red to the white, and finally to the cape. It makes for a bit more work, but it makes the it more manageable. As I mentioned earlier, knits can be a bit shifty, they also like to get chewed up in the feed dogs of my machine (anybody elses?). 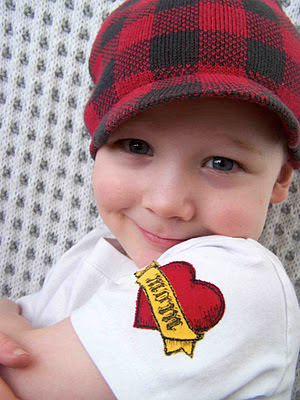 To prevent shifting and chewing, stabilizers can make the applique/embroidery process much easier. Stabilizers come in many forms. 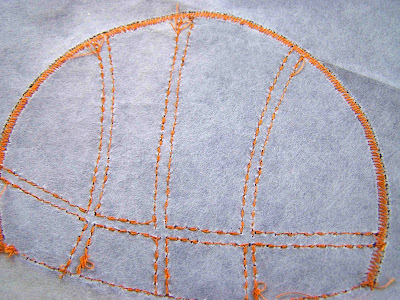 There are tear away stabilizers (pictured above), that are placed under the fabric, and then torn away when the applique is complete. There are also wash away stabilizers that come out in the wash. They all do the same thing, and I don't have much of an opinion one way or the other. If you don't have any temporary stabilizer available, a lightweight fusible interfacing will do the trick as well. Just adhere it to the wrong side of the material before securing your applique. There are a number of different stitches that you could use for an applique. 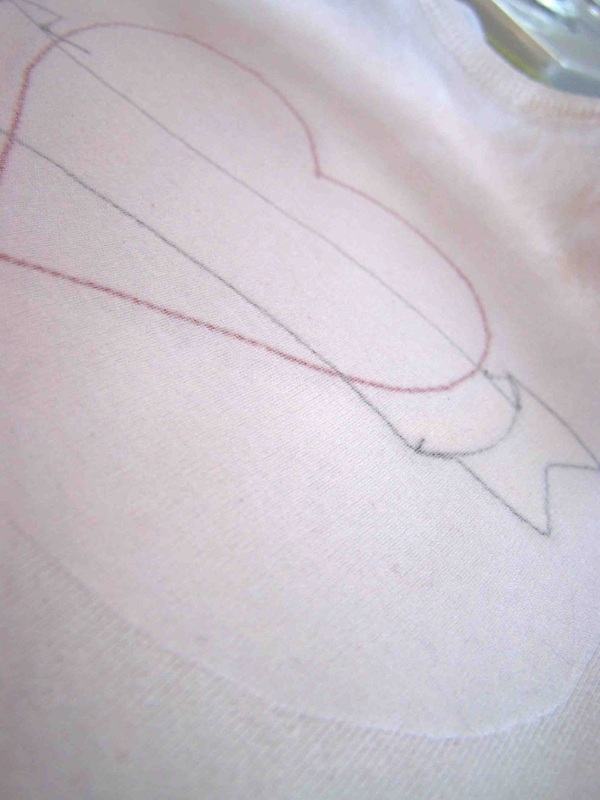 A satin stitch is the most common when you are appliqueing a fabric that will fray. If you aren't familiar with a satin stitch (machine stitching), it most often refers to a tight zig zag stitch. This can be achieved by decreasing the space between your stitches. For the applique down below I set my stitch length to .5, if I were working with a cotton applique I probably would have decreased it even more. 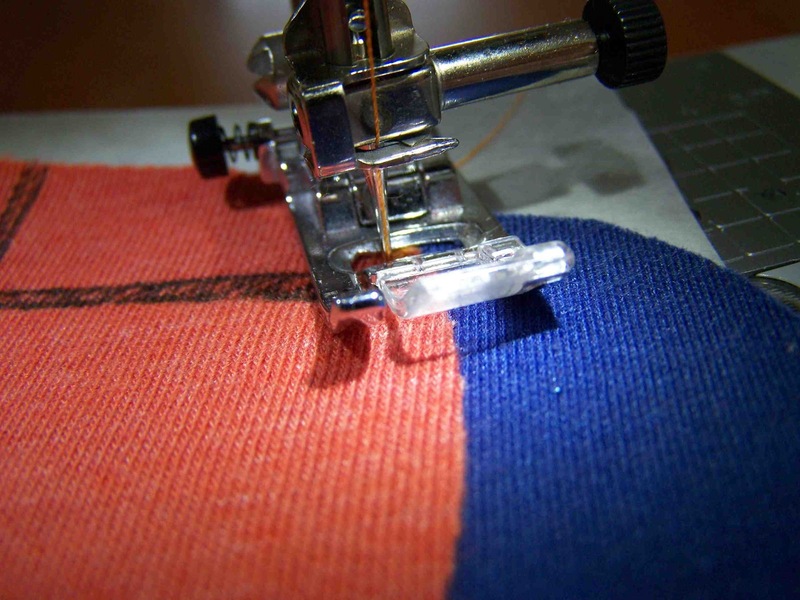 The stitch width will determine how wide your zig zag is. 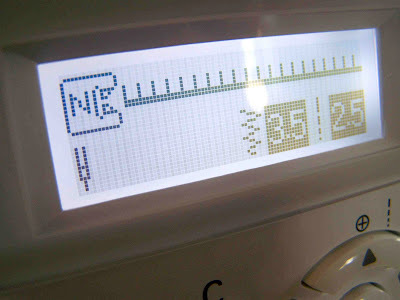 I left mine at the standard setting, but if you are doing a very small applique you can drop it down to 2.5, or 2.0 so that you can follow the contour of your shape. The outside point of your zig zag should sit just off the raw edge of your applique. 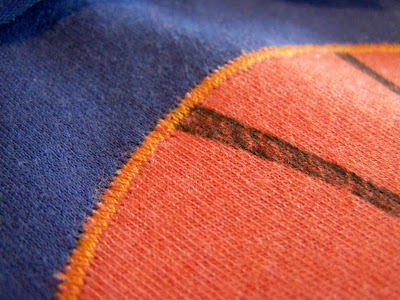 The zig zags sit nearly on top of each other, capturing all of the raw edges, and making for a nice clean stitch. Don't get me wrong, I love me a satin stitch, but working with knits allows a bit more flexibility. 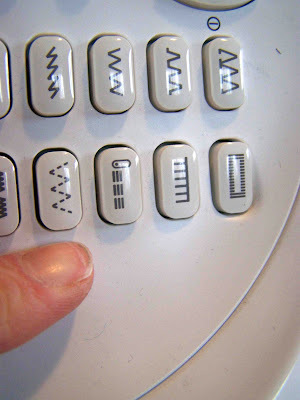 One option that is available on some machines is a faux blanket stitch. It consists of a straight line- which are usually at least triple stitched, and some perpendicular stitches that will go either to the right or the left of the straight stitches. This can add a nice decorative effect, and still clean up some of those raw edges. To use this stitch you will first want to determine which direction your horizontal stitches go, and set up to sew accordingly. You will want to keep your straight line stitches just off the raw edge of your applique. The horizontal stitches will secure your applique, while the vertical stitches clean up the edge. I don't recommend this stitch of really detailed shapes, such as stars, or that bat shape down below, but it's great for things curves and basic shapes. 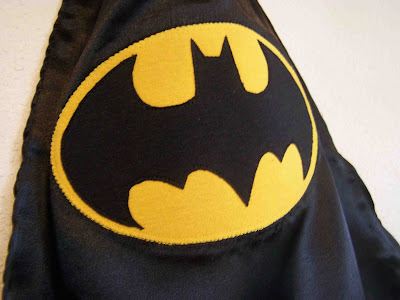 You can tell that I used the faux blanket stitch on the oval of the bat emblem. It worked like a dream. 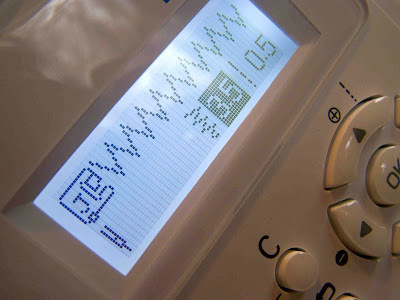 I've used this stitch for squares and rectangles as well, it just takes a bit more experience. You really want to be familiar with the stitch so that you know when you will complete the stitch sequence, and when it is safe to pivot around a corner. Those of you that follow my blog will now that the triple stretch stitch is a favorite of mine. It provides stretch to the stitch, reinforcement to a seam, and can be quite decorative. I love to use this stitch when I am working with small or intricate shapes. 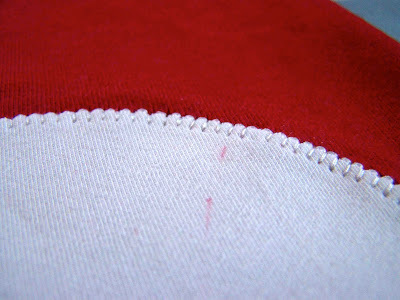 This stitch doesn't do anything to the raw edge, but it secures the applique in place. This is the same stitch that I used on the spiderman applique above. You can follow curves, and make tight corners. For those small light bulbs I decreased the stitch length, but I love to lengthen the stitch for larger shapes. Triple stretch stitch on my machine. 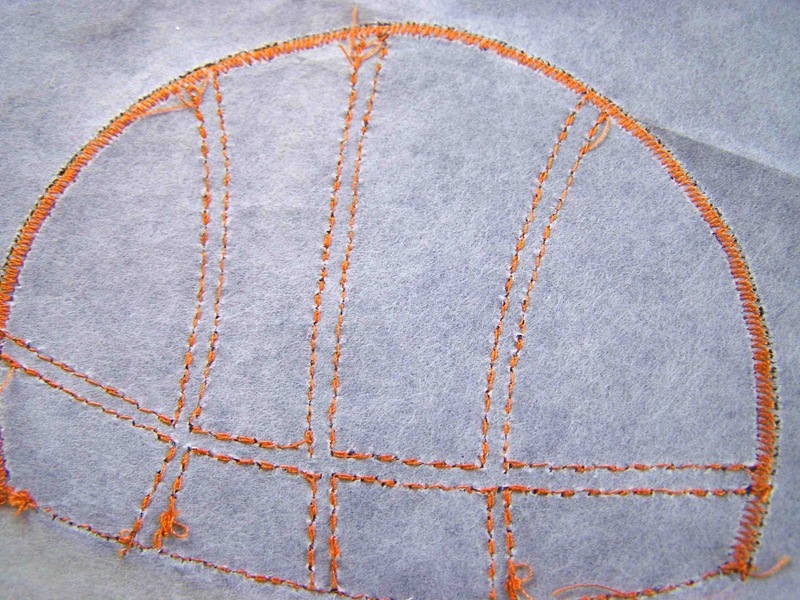 I use the triple stretch stitch on the inside of my applique, and never cast it over the edge. Due to the fact that my stitches are all within my applique, I often skip the stabilizer. The double thickness of material provides me with enough stability. When I'm working with a knit top, or article of clothing, I like to encase all of the stitching that's on the wrong side of the fabric with a bit of fusible interfacing. It will make the article of clothing more comfortable, and secure the stitching. There are specialty stretch interfacings that are available. 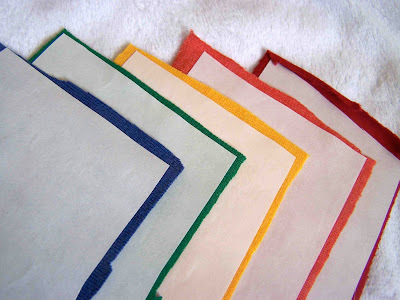 They'll stretch with the fabric, and won't pull away like a woven interfacing. I just recently discovered this...I don't know why it took me so long. I found it at my local Joann's store, sold by the yard with the other interfacings. NOTE: I always use my ball point sewing machine needles when sewing a knit garment. If I'm appliqueing an item other than knit, such as the satin capes, I'll use a standard needle for the applique. That's it. My two cents about appliqueing with knits. I thought that this was going to be a short little post, but somehow it turned into a beast of a thing. Hope it helps. Great post! Very informative and practical with clear examples. I'll have to look for stretch interfacing the next time I'm at Joann's (I'm really trying not to buy more stuff without using up what I have). :) My machine only has eight stitches but I've seen the faux blanket stitch and will have to try it sometime. PS yes, my knits like to get sucked into the feed dogs. It definitely happens a lot more with flimsy and/or cheap knits. I use a larger seam allowance (closer to 1/2 inch rather than a 1/4) and start stitching a little bit into the seam before back stitching (like an inch more into the seam than I normally would) b/c I used to have trouble with the backstitching at the beginning of the seam.